For the past two weeks, a massive dust storm has churned on Mars, forcing NASA to put its Opportunity rover into hibernation mode. But Curiosity, a rover on the other side of the planet, is now feeling the effects of the storm as well, revealing the dramatic, planet-size scale of this dusty weather system. The extent of this dust storm is nearly incomprehensible — about the combined size of North America and Russia. NASA says the storm now spans the entire circumference of Mars, making it a planet-encircling dust event. The Opportunity rover, which is dependent upon solar power, is (fingers crossed) only temporarily out of commission. The Curiosity rover, located about 5,000 miles (8,200) away from Opportunity, is now feeling the effects as well, with the amount of airborne dust above it doubling in the past week. The dimming created by this atmospheric haze, measured in tau, is now about 8.0 at Gale Crater, which is the highest recorded tau in the history of the Curiosity mission. At Opportunity’s location, the tau is at 11, making it really dark. But unlike Opportunity, Curiosity is in no danger of losing power, as it relies on a nuclear-powered battery. Two images taken by Curiosity rover show the change in the colour of light illuminating the Martian surface since a dust storm engulfed Gale Crater. The left image shows the “Duluth” drill site on May 21, and the right image is from June 17. The vivid red colour is due to different exposure times for the two images, and to dust grains in the atmosphere letting red light through to the surface, but not green or blue. That’s not to say the storm isn’t affecting Curiosity. 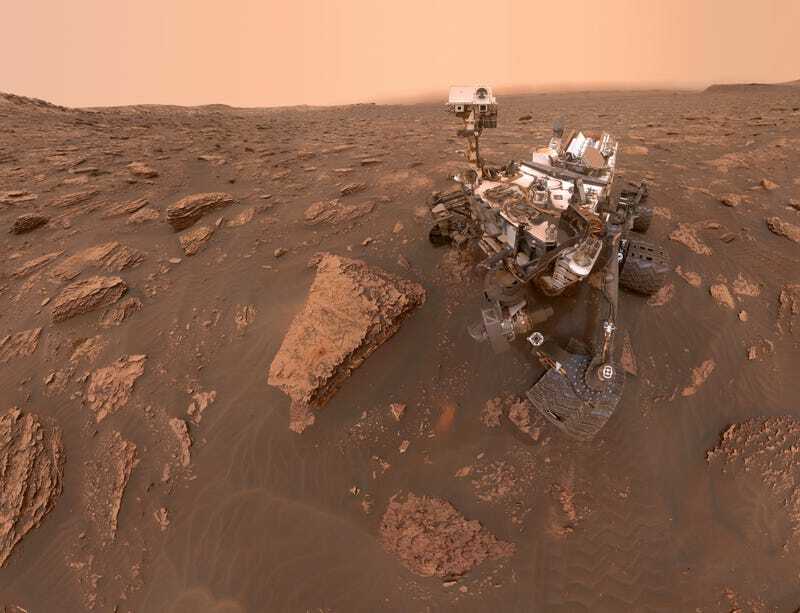 Because of the dim lighting, Curiosity’s cameras require extra exposure time, and extra exposure time means the optical equipment is more vulnerable to all the dust that’s blowing around. The current situation is not ideal. But Curiosity did manage to take some recent photos of the Martian landscape, revealing an increasingly dense wall of haze, which is about six to eight times thicker than usual. A self-portrait by NASA’s Curiosity rover, taken on June 15, 2018. Check out the dusty horizon line, and the lower-than-usual lighting. Martian dust storms are common, especially during southern hemisphere spring and summer, when the planet is closest to the Sun. As the atmosphere warms, winds generated by larger contrasts in surface temperature at different locations mobilize dust particles the size of individual talcum powder grains. Carbon dioxide frozen on the winter polar cap evaporates, thickening the atmosphere and increasing the surface pressure. This enhances the process by helping suspend the dust particles in the air. In some cases, the dust clouds reach up to 40 miles (60 kilometres) or more in elevation. Some storms on Mars last for a few weeks, while others go on for years. The factors that drive these variations are still not fully understood, which is why this storm, the most powerful to hit the Red Planet since 2007, is of great interest to scientists. 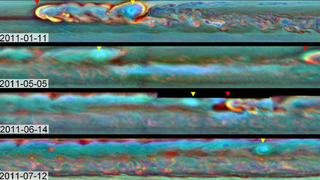 In 2013, the leading edge of a storm wrapped around the entire planet of Saturn, eventually catching its tail.